For several months prior to March 2014 the peace organization Code Pink was in communication with Egyptian diplomatic representatives in the United States. The two sides were arranging for the arrival of approximately 100 women from around the globe who would come to Egypt, travel up to the Rafah border crossing with Gaza, and (if prevented from actually crossing into the besieged territory) hold a demonstration on International Women's Day (March 8) to show solidarity with the women of Gaza. 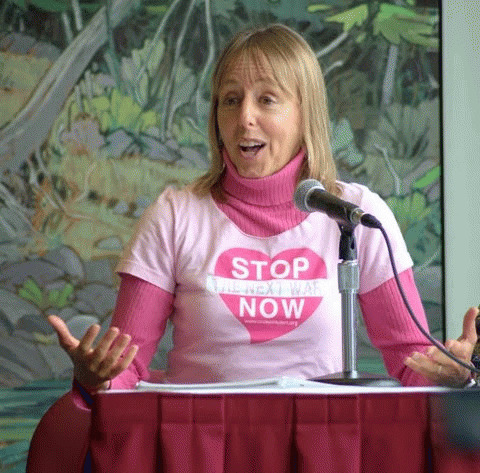 One of the principal organizers of this event was the well-known peace activist Medea Benjamin, winner of such awards as the Martin Luther King Peace Prize (2010), the Marjorie Kellogg National Peacemaker Award (2012), the Thomas Merton Center Peace Award (2012) and the Peace Foundation Memorial Award (2012). Benjamin is, as the Los Angeles Times put it, "One of the high profile leaders" of the American peace movement. "I arrived at the airport. When I gave in my passport, I was taken aside, brought into a separate room, where I was held for seven hours without anybody ever telling me what was wrong. Then I was put into a jail cell at the airport, held overnight. And in the morning, five very scary-looking men came in and wanted to take me away. And I said, the [U.S.] embassy is coming. They were supposed to have arrived. Instead, the men dragged me out, tackled me to the ground, jumped on me, handcuffed my wrists so tight that they started bleeding, and then dislocated my shoulder, and then kept me like that grabbing my arm." In the meantime both the Code Pink members who had accompanied Benjamin to Egypt as well as those in the U.S. were pleading for help from the U.S. embassy in Cairo. They would continue to plead for some 13 hours. The embassy refused any assistance, telling the women that they "were on their own." When an official at the Egyptian interior ministry, Brigadier Alaa Mahmoud, was asked about the incident by CNN, he replied, "Benjamin was not detained. She was denied entry because her stated reason for visiting Egypt was to make a trip to Gaza. Authorities explained to her that the crossing was closed and consequently refused to allow her to enter the country." He denied that she was assaulted or that force was used on her. Here is what I surmise happened. Medea Benjamin's horrid treatment was not a mistake. It was not the action of a few rogue border officials. It was a premeditated act on the part of the military dictatorship that now passes for a government in Egypt. Who gave the orders? No doubt this plot started in Washington when someone, probably a security officer attached to the visa department at the Egyptian embassy, recognized Benjamin's name. He alerted someone in Cairo that a major supporter of the Palestinians and someone who had spoken up for democracy across the region was coming to Egypt. Then someone in Cairo decided to make an example of her. After all, when an American embassy gets a call from a U.S. citizen who has just been assaulted and harmed to the point that they need hospitalization, the standard policy is to render assistance. If necessary, an embassy representative is dispatched to the scene to ensure such assistance. To deny such aid is so counter to policy that any embassy employee doing so is putting their job in jeopardy. Unless, of course, someone higher up has explicitly changed the rules. That is unlikely to have been done on the spur of the moment by someone at the embassy in Cairo. Such a negation of policy would have had to come from someone relatively high up in the Department of State or perhaps the White House.